This is how SharePort works, I will use my DIR-655 and Brother DCP-150C MFC as an example. The DIR-655 has a USB port on the back, tests seem to indicate it is a USB 1.1 port, up until now the port was used for wireless settings that could be stored on a USB key. After installing the new firmware however the USB port has found more use, we’re greeted with a new menu under Setup that controls the use of the port. Choosing Network USB puts the router in SharePort mode, choosing 3G USB Adapter is a bit of a mystery to me, I’m not sure what devices are compatible with this yet, however as most people do, I have a 3G service and using it as a backup by only connecting the device up to the USB port and choosing 3G USB Adapter would be very handy. Once you have chosen Network USB the device is automatically shared, however in order to connect you must install the SharePort software from D-Link, this is still in Beta it appears so use with caution etc etc, I haven’t had a problem with it yet and it seems fairly polished. once it is installed make sure you allow it to run at startup and run it straight away, otherwise you won’t be able to use the device without manually running the SharePort software each time, it only uses 2MB of ram so it’s not a resource hog. 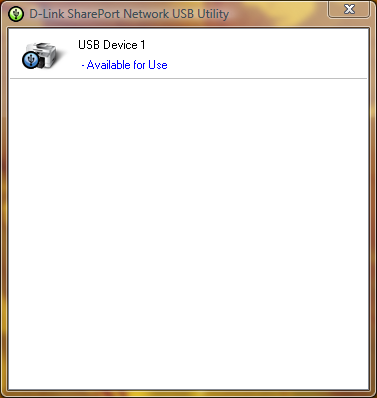 If your USB device is on and connected then the SharePort utility should display like this once you double click on the icon in the system tray. It will then allow you to run through a wizard for installing the device, you will need your device’s driver cd or the latest driver for their website, at the end you will be asked if you want to automatically connect to the device when you print if it is a printer, this is a good idea otherwise you must manually choose to connect. Once that is all set up on each computer that uses the device, you will notice that each device states that the printer is paused and offline, print to the printer anyway, the SharePort software detects that a print has been sent to the printer and it automatically assigns the printer to your computer and while the printer is communicating with your PC it will show as connected, once the print job has been finished it will then return back to offline, paused. The limitation of this feature is that it will only work on one PC at a time, USB devices simply aren’t designed to be connected to 2 PCs at once so it makes sense why this is the case. 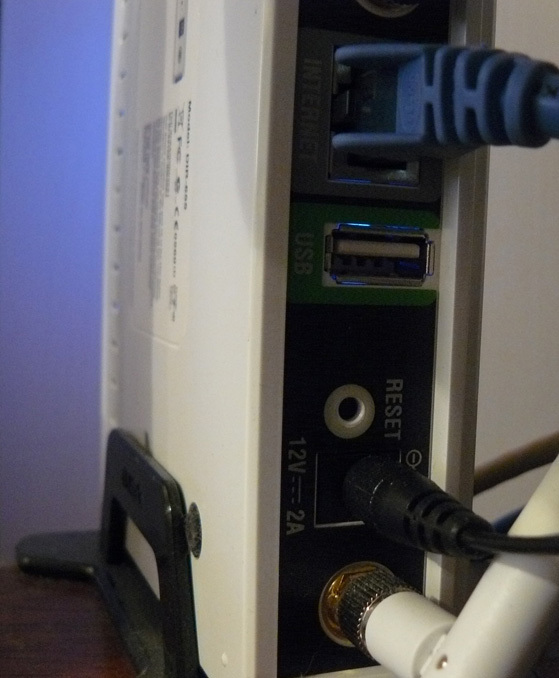 I have not tried such things as webcams however they have been known to work, however at a slower rate than normal, the scanner feature of my printer works fine, however you must manually connect using the SharePort software to use it, make sure you disconnect after you are done. As I stated at the start of this article the SharePort software is something I have been waiting a long time for, it’s a great feature considering my router is not the latest out there now and it almost seemed like D-Link had given up adding new features to it, it also shows how well the device can work if it can handle a USB device while it is performing all it’s other duties. I just bought a D-link Dir-655 from a man on Ebay, The router is H/W A3 and the F/W 1.21 firmware. 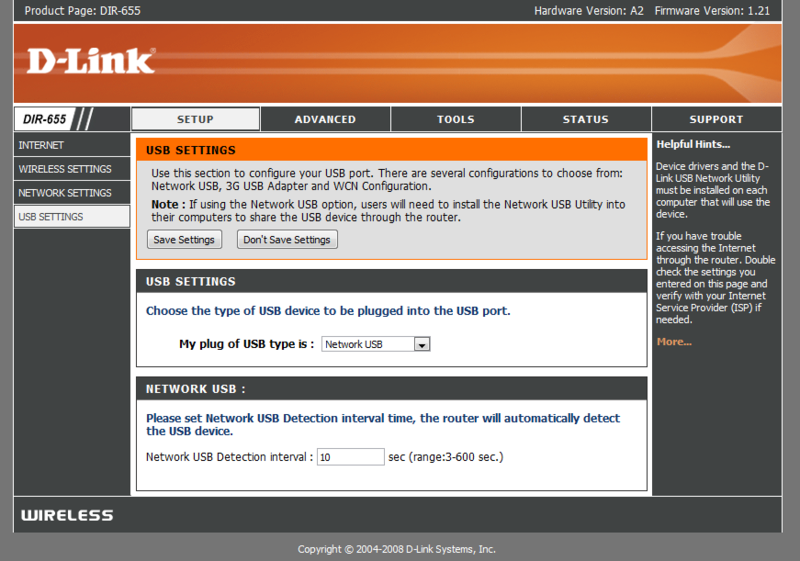 I have read on the internet a number of things about different firmware levels that D-link has released. BUT am confused as to which is the best for this version A3. Some people have been very unhappy after up-grading to a newer level firmware. I am not going to use the USB connection. SO which is the BEST firmware to have installed on the A3 model. All I am looking for is a fast return and connection speed with stability. I have a cable connection as my supplier via a modem, from the cable company. As far as I remember 1.21 was the first release with SharePort, despite this it’s considered to be one of the best versions before the 1.3x releases, so if it’s currently working well for you it’s probably not necessary to change because from my experiences the only things that change with newer or older firmware tend to be stability and that’s usually for the worse in the case of newer firmware, there also aren’t really any new features that the new firmwares have, just attempts at bugfixes that as you can see from the comments tend to make things worse. Hi Ben, I am from Australia too. I previously had my router on 1.30ww at which i always had dropouts with internet and wireless. Sometimes i just had to reconnect my client (a wireless client bridge DD WRT router), but other times it required reboots of the DIR655. I updated to 1.35NA, and experienced more frequent dropouts, but of lesser magnitude (usually corrected itself in minutes) but I wasnt satisfied. So I used a downgrade firmware and I’m on 1.34WW right now and for the last hour have had no dropouts but still suspect it will. Thanks for the info on Dir-655 routers. I have one running on 1.34NA which came with 1.02, the router is a A2 and this seems to helped the speed after going to 1.34 NA. 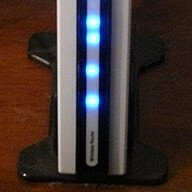 I have for some time been trying to find the best firmware for this router? What is the feeling of a number of people you speak with? This thing does slow down now and then but I just pull the power plug wait 30 seconds and re-install the power and all seems ok.
seems to know what happened to the router? I guess the only way to repair the unit is a new Mother board? Hi Alec, I would definitely recommend 1.11 for a router that doesn’t play well with the rest, it is by far the most stable version that was released and is consistently mentioned from others with dropouts as the only fix that has worked. Hi Bob, The only contact I have ever had with other users of the 655 is via my site, though I did frequent the D-Link forums when the router was still actively supported, from what I have seen the performance varies wildly between the individual routers, though the 1.3xNA firmwares seemed to cause the most consistent trouble. If you’re not going to use Shareport you can try the 1.11 firmware if you can find it, as it’s not only fairly fast but it (as mentioned above) is considered the most stable. On top of this a common cause of slowdowns seems to be the DNS forwarding feature, it had some issues in the earlier 1.3x versions but I believe it’s supposed to be fixed now. I’m afraid I’m not familiar with the 625, but from the sounds of it the board probably is completely dead, unless it’s the power supply. Thanks for the reply, about the Dir-625 the power supply is OK.
to the firware, like about 25 updates from the orginial 1.10 it came with? I’m afraid i’m not familiar with the B version of the router at all, though 25 firmware updates is a bit alarming. Here it is, 2015, and SharePort still doesn’t work. 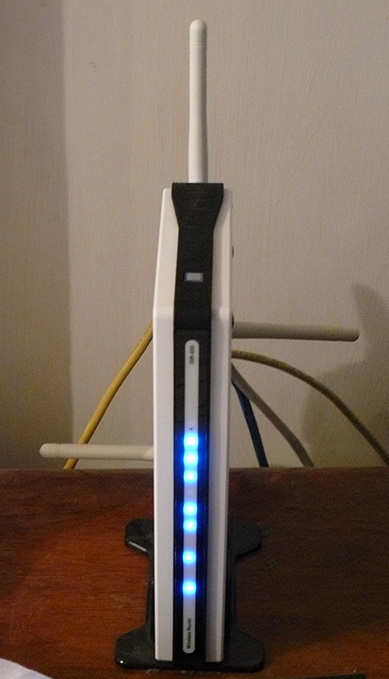 Sometimes I can stick a USB drive in, unplug it, plug it back in (the router’s power cord), and it MAY work. Most of the time it doesn’t, but when it does, it doesn’t last long.